Choosing the right LCD monitor is crucial. Every time someone looks at it - whether they are customers, colleagues or conference delegates - the quality and clarity of your digital signage creates a powerful and lasting impression. Our range of commercial displays and digital signage screens include monitors for a wide range of specialist applications. 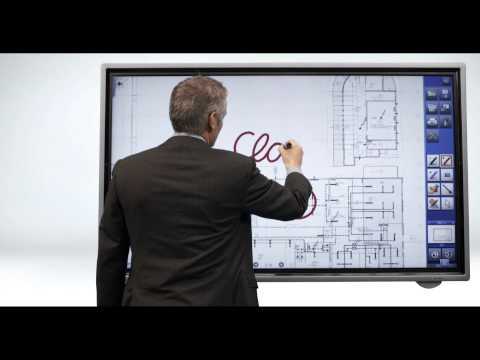 In boardrooms, large meeting rooms and classrooms, for example, our BIG PAD interactive whiteboards make it easy to communicate complex subjects and encourage collaboration and group participation. For retail areas, our 4K displays will get your message across with impressive, attention-grabbing clarity that makes people pause and pay attention. At public events, showrooms, trade shows, exhibitions and lobbies, our corporate signage solutions are ideal for advertising and continuous-loop videos that inform and entertain. Whatever you’re looking for, from affordable LCD monitors for close up use through to impressive stunning 4K display walls and everything in-between, there’s a Sharp digital signage solution that will make your first impression really count. 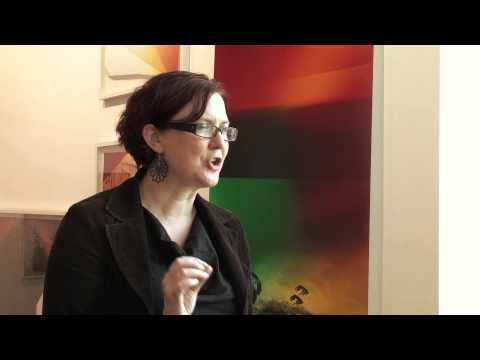 Create and sustain enhanced learning environments across the breadth of the education sector. In primary and secondary schools, higher education, colleges, universities and beyond in to corporate and adult training, the opportunity to optimise engagement and stimulate students can be realised with our innovative professional displays. Despite combining advanced high definition and touch screen technology with the ability to integrate through wireless connectivity to other devices, Sharp expertise and understanding ensures these advanced benefits are intuitive and easy to use to ensure teachers can focus on their teaching not the technology. Bring learning to life across all age groups with highly stimulating and engaging visual information. Teachers and students can collaborate and enjoy a more productive learning experience with interactivity enabled by Sharp’s BIG PAD. Create and deliver compelling interactive presentations using annotation to increase understanding of the material and encourage collaboration between students and teaching professionals to create a more immersive learning experience. Use Sharp professional displays in foyer, reception and other communal areas to ensure all students are aware of crucial information and announcements. Welcome delegates within corporate and adult training scenarios and provide relevant information with efficient and highly visible digital signage in reception areas. Optimise their engagement and interaction within lectures and tutor sessions with Sharp’s BIG PAD interactive displays, touch monitors and innovative Sharp software enabling enhanced presentation, collaboration and sharing. The need to make a positive and lasting impression in the competitive corporate world has never been greater. Sharp’s class leading innovation and expertise allow organisations to benefit from new standards of presentation and display. From creating a memorable and impressive welcome in reception areas, through opportunities for interactive meeting room capabilities and video-conferencing, to the ability to display and work with complex and detailed financial data on ultra high definition monitors, there is no limit to the contribution Sharp Visual Solutions can make to the corporate working environment. Stimulate new levels of engagement and interaction within presentations and video conferences with a Sharp BIG PAD large format interactive monitor. BIG PAD combines the power of display with on-screen annotation to give a total solution for presentations. 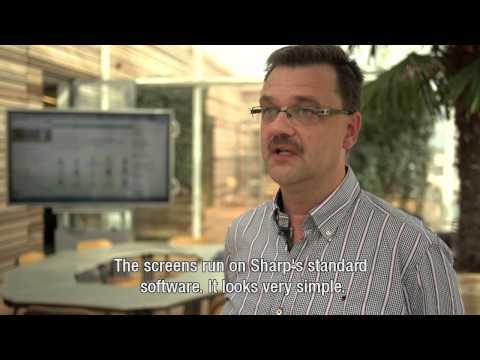 Use Sharp’s Touch Display Link software to allow delegates to share information and collaborate between BIG PAD and mobile devices or install a 20” touch monitor with BIG PAD to allow more flexibility in presentation style. Transform reception areas into memorable and dynamic environments to reinforce the credibility and stature of your organisation. Combine high definition video wall displays to enhance first impressions and showcase your company’s credentials with individual digital displays communicating personal visitor greetings to establish a professional yet welcoming tone for meetings. Enable maximum clarity of detailed information in trading room environments by using our ultra-high resolution displays, either individually or in multiple configurations. Provide enhanced productivity and space efficiency in desk top scenarios when working with extensive and complex data. Stimulate footfall and dramatically enhance store appeal with Sharp’s high impact professional displays to optimise brand identity and recognition within busy retail environments. Our expertise can help reinforce credibility by creating memorable in store ambience, enable communication of seasonal, tactical and promotional messages throughout the store and introduce innovative new ways to optimise engagement with customers and drive incremental sales. In even the most challenging and competitive retail environments, Sharp expertise and innovation can always deliver a solution that will make a lasting impression on customers and prospects alike. Our innovative touch monitors can enable interactive demonstrations and highly effective sharing of digital data or information on a one on one basis to maximise customer engagement and increase the potential for conversion to sales. Sharp’s touch screen technology in fixed kiosk or sales terminal applications can deliver additional customer interaction and deliver browse and buy opportunities without the need for staff involvement. Enhance leisure environments and reinforce entertainment credentials across the breadth of this dynamic and highly competitive industry. Maximise appetite appeal in restaurants with high definition displays, share multiple video or active programming in bars, clubs and gyms to appeal to all customers simultaneously, create unique and memorable ambience in hotel lobby and reception areas to reinforce credibility and differentiation. Transform static exhibitions and museum displays into engaging interactive experiences with the addition of touch screen technology and video displays. Sharp understand the need to optimise every customer experience and always commit their expertise to realise each and every opportunity. Create desirable and memorable entertainment environments with multiple screening of active programming or videos on our high definition displays. Introduce high impact communication of menus, prices or promotions with our digital signage or introduce new ways to order with interactive table top touch screens. Make an unforgettable first impression and extend a warm welcome in reception areas with our large format displays and communicate essential guest information day and night on screens developed specifically for around the clock usage. Maximise appreciation of and interaction with exhibits with our ultra high definition screens allowing close up appreciation of the finest details, whilst Sharp’s in monitor touch screen technology can enable accurate selection of specific areas of interest. We are proud our commitment to excellence and innovation meets the demands of design professionals for whom the monitor is an essential tool in the delivery of their craft. Our ultra high definition IGZO monitors deliver absolute image quality and accurate representation of the finest details including exceptional colour accuracy while Sharp touch screen technology enables CAD designers, creative and graphics professionals and video game developers to interact directly with images and enjoy exceptional detail to ensure total accuracy whether working with mouse or stylus. Clearly communicate essential information to mass and transient audiences in even the most physically demanding environments. Understanding the unique challenges of 24/7 operation in locations with high levels of dust, vibration and temperature change, Sharp expertise delivers absolute reliability and durability. Thanks to our commitment to innovation and excellence, we offer LED high resolution in large screen formats up to 90” to ensure legibility of complex and continually changing detail in brightly lit or daylight environments, all specifically developed to for allow portrait or landscape installations. Maximise retail revenue and engagement with mass audiences in high traffic concourse areas with Sharp’s class leading digital signage specifically developed to deliver the durability demanded by such physically challenging locations. Harness the power of scale with dramatic eye catching large format video walls. Create a powerful and memorable visual focal point at events of all sizes with flexible modular video wall technology. Our innovative ultra slim bezel screens can be used modularly to meet the exact requirements for any event, with individual displays with up to 90” screen sizes and multiple brightness modes, image clarity will always be optimised in all conditions. Whether it be a concert, an exhibition, a corporate event or perimeter signage at sports events on either a permanent or temporary basis, with Sharp’s expertise you can be assured of making a positive and impressive impact on audiences of all sizes. When absolute accuracy and visual clarity is not just desired but is essential, Sharp have the expertise and class leading innovation to deliver. Interactive large format touch screen technology and ultra high definition screens bring crucial levels of detail to medical training, while patient consultation across GP, consultant and dental sectors can be enhanced through the sharing of key information in perfect detail. Our technology can help to establish a reassuring ambience and enable the communication of important or commercial messages to transform a waiting room into a positive and comfortable environment. Our ultra high definition image quality delivers accurate representation of the smallest vital details while Sharp’s BIG PAD large format interactive displays with annotation software provide a flexible, fully interactive and engaging learning tool. Enhance one on one consultation with the ability to review images, test results, scans, treatments and other visual information with Sharp’s ultra high definition technology and on screen annotation capabilities. Our commitment to excellence and innovation is reflected by the extent to which Sharp solutions are trusted throughout the technically demanding professional broadcast and video production industries, whether they be in studio, on location or in specialist post production studios. 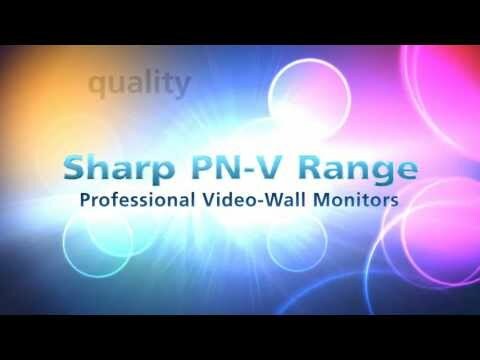 From high profile broadcast analysis and presentation tools or large format studio background video walls, to delivering the ultra high definition control suite and location monitors, Sharp expertise delivers the levels of image quality and detailed technical control demanded by the most exacting professionals. These challenging professional environments demand displays with the highest level of features including absolute image quality, colour accuracy and full control of image settings. Sharp professional displays can deliver these essential requirements. Sharp technology adds enhanced levels of appeal to studio sets, with individual or multiple screen combinations of our thin bezel ultra high reoslution displays allowing dynamic multi sceen video wall backgrounds and our BIG PAD interactive screen facilitating engaging analysis of high profile sports including football and motor racing. As the professional demands of location and camera feed monitors continue to increase, so does our commitment to provide the highest standards. Our ultra high definition monitors deliver essential broadcast standard image quality, colour temperature control plus overscan and underscan capabilities to ensure the broadcast professional has full control and aboslute accuracy both in studio and on location.